I am determined to create a vacation Travel Sketchbook when we are on trips, yet I find that I constantly have to remind myself to draw by having internal dialogues each day. My primary goal is to draw/paint a minimum of one page per day. I arrived in Barcelona after an overnight flight with horrible bronchitis and no appetite, so as we struggled to remain awake, we returned to our favorite Tapas restaurant just 2 blocks from our hotel. As I sat there, tired and sick, I knew that I needed to start drawing, and reminded myself "just draw what is in front of you." So I did. The next day we walked through Barri Gotic, stopping for Brunch Tapas in the Plaza in front of the Cathedral. 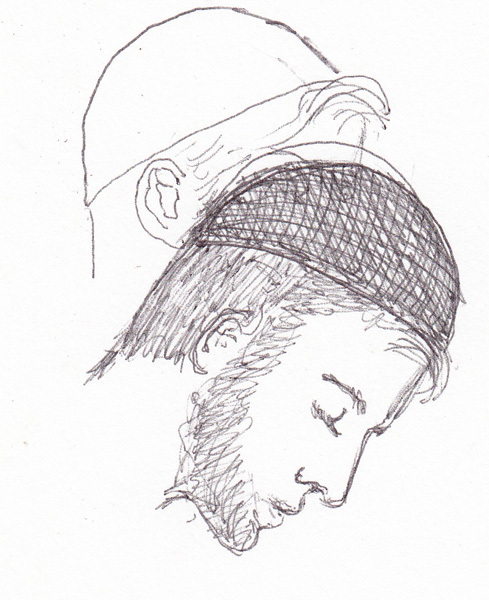 Once again, I decided to just sketch what was in front of me from our outdoor restaurant. October 12th, Columbus Day, is a National Holiday in Barecelona, and we spent the day exploring Gracia - walking many miles in the process. 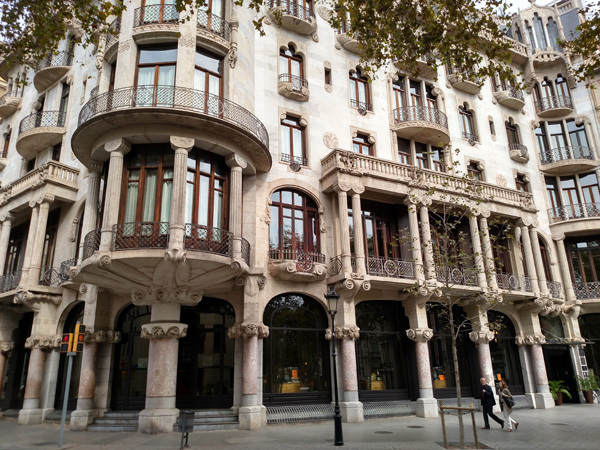 As we returned to Passeig de Gracia we saw the Casa Fuster hotel in daylight. WOW! Another gorgeous example of modernist architecture in our neighborhood. We sat in the small park across the street and I sketched the sculpture in front of me while my husband did the daily New York Times crossword puzzle. He is fast, so I have to plan my drawing time accordingly. I will upload drawings from three more days later this week - while I'm at the International Quilt Festival in Houston. And I still need to add a watercolor wash to other paintings. 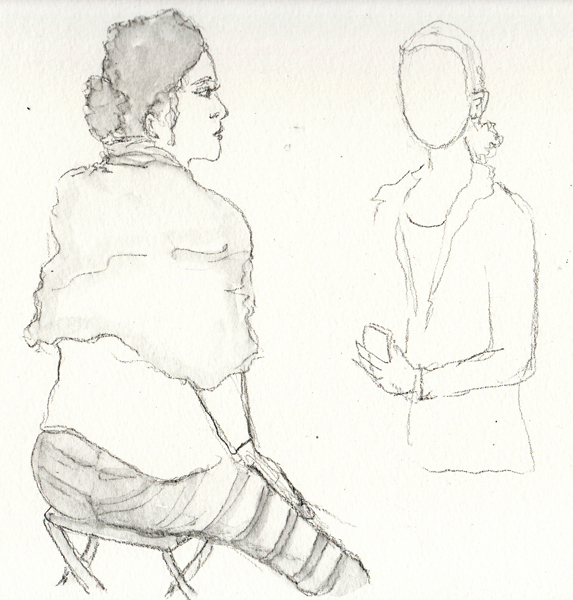 I have at least two more Sketchbook blog posts. I met my friends, the day after we returned from Barcelona, for two museum visits in New York City. 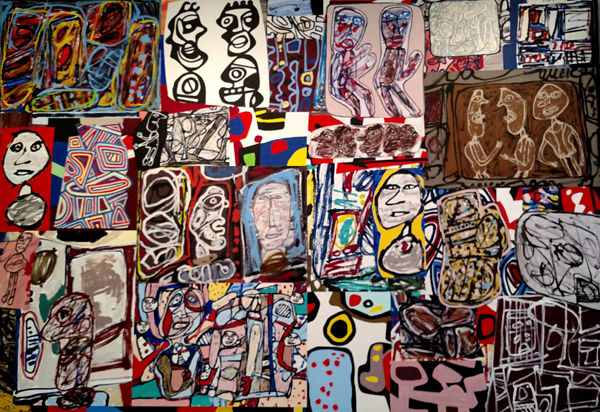 We marveled at Dubuffet's Drawings at the Morgan Library, had lunch, and then went uptown to the Met Breuer to see the Paul Klee exhibit. 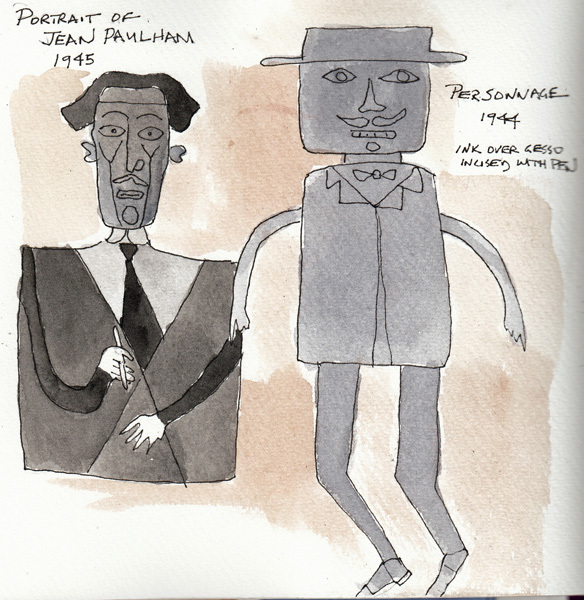 I always draw from the originals at these museum visits and here are 3 sketchbook pages from Dubuffet and 1 from Klee. 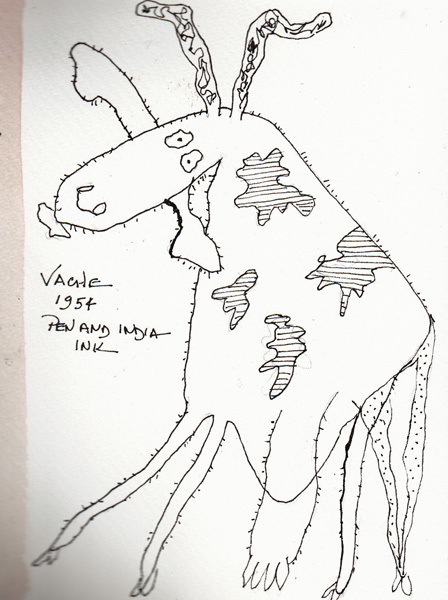 Dubuffet - La Vache: Loved the whimsical drawing. 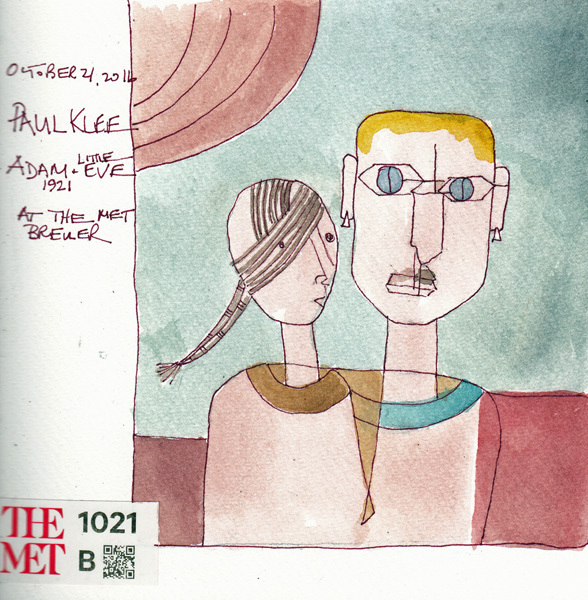 I love seeing Paul Klee's paintings, but so many of thesm are exercises in painting and design. I painted one of the most realistic draiwings: Adam and Little Eve from 1921. 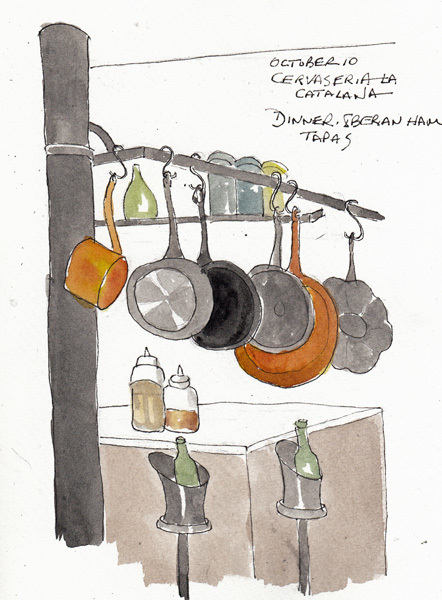 We returned from Barcelona this week, and I wanted to start posting some of my travel sketchbook pages. 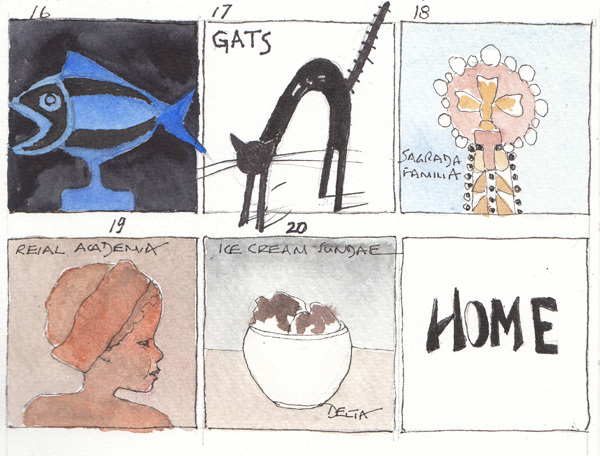 Today I will post recurring features that I make part of each of my travel sketchbooks. 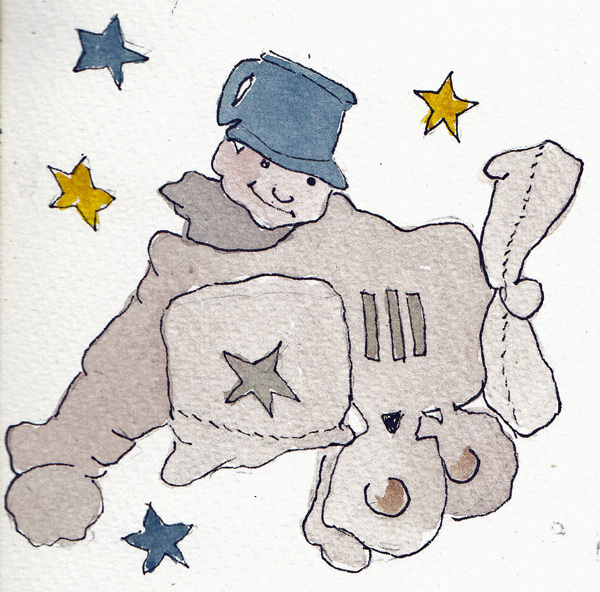 Then as I finally paint the rest of my drawings, I will add them to my blog. 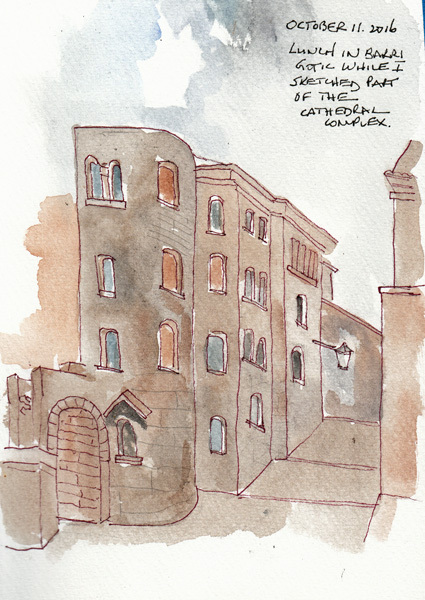 I have photos taken of the site for each ink drawing, so I can remember the colors. My husband is very patient, so I always have 15-20 minutes to do a drawing on site, but I don't want him to wait while I paint. Sometimes I paint during lunch, or a late afternoon glass of wine. But this time I returned with more unfinished pages than usual. This plan will help me finish a travel sketchbook that I really enjoyed making, otherwise I may get busy and forget about my overall plan. I always draw Mickey in his bread dough plane (from Maurice Sendak) on the title page for overseas trips, and I add every piece of information I can think of to make sure a lost sketchbook will be returned to me. 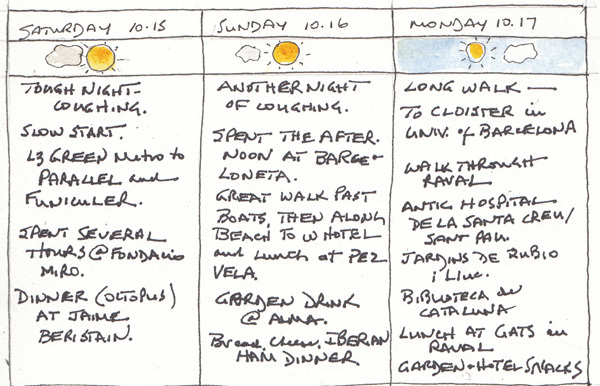 Before we leave I create a calendar on several pages, so I can fill in our activities at the end of each day. This is an example from 3 days. I also make a series of 2 X 2 squares that I can fill in daily, adding some image that will allow me to remember a highlight of the day. 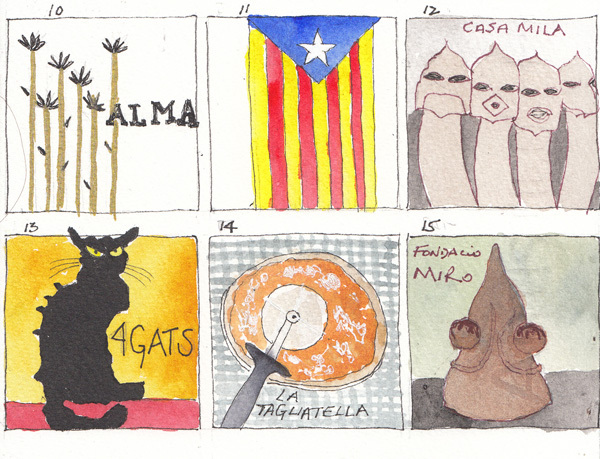 Here are the squares I painted during the entire trip. A View from our hotel window. 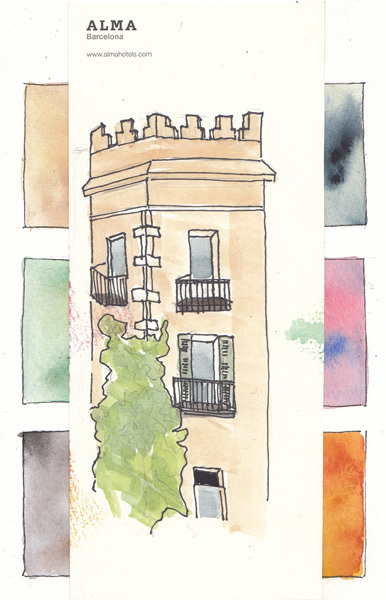 I am far behind in Liz Steel's Buildings online class, but wanted a quick sketch of the top of the back of this beautiful apartment building in Eixample, Barcelona. 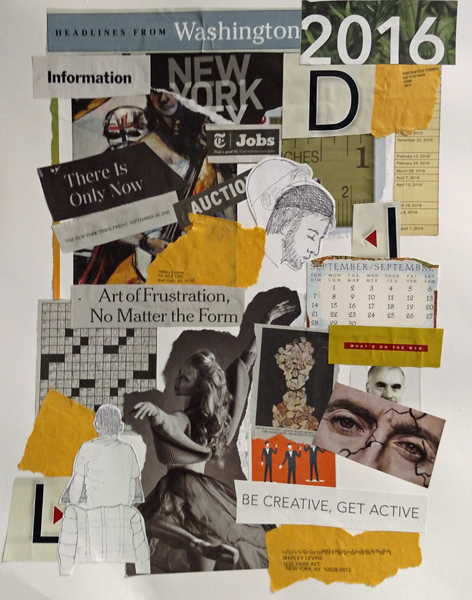 This past Wednesday I attended a Collage class at MoMA. Before I went I gathered some recent mail, and two drawings I did in ballpoint pen on index cards. I cut out or ripped headlines and photos from my mail, looking for a theme. I had items from the newspaper and a magazine, and even a return address on a manila envelope from Hillary Clinton. The bowed head I sketched represents to me one of the muslims that Trump wants to keep out of our country. The news headline "Art of Frustration No Matter the Form" made me think of the stress of this election, where a totally incompetent, sociopathic candidate like Trump could be nominated by a major party. I interpreted this quote literally as ART born from frustration and included images of a dancer, singers, my drawing, Dubuffet's painting, and a photograph. "Be Creative, Get Active," and stay sane, is my mantra until Nov 8th. I went to Figure Al Fresco in Battery Park City in the afternoon, but only stayed for part of the session. Here is a quick sketch of Regina between poses and a ten minute pose drawn with a soluble graphite pencil and shaded with a waterbrush. 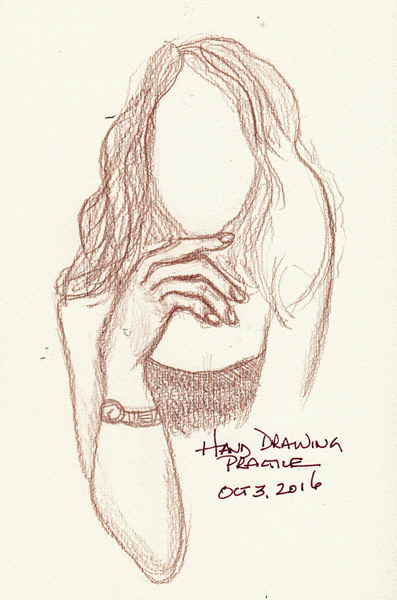 I'm just posting a few drawings that I did from photos today. Last week was too busy and I very distracted from art. 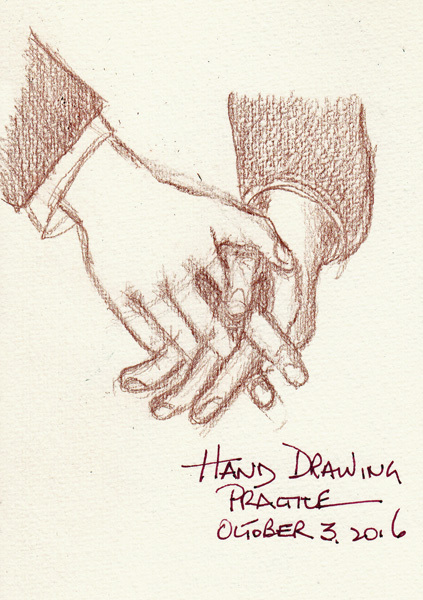 The photos used for the hand drawings are from fashion ads and drawn with a colored pencil. I drew these heads from TV when I paused a show during a phone call. Drawing in ink.